Our series of interesting* team preview posts begins on the shores of the Cuyahoga River. In his first season at the helm of the Cleveland clubhouse, Terry Francona exceeded most expectations. The 2012 Indians went 68-94, but they turned things around all the way to 92 wins and an appearance in the AL Wild Card Game last year. This offseason, the front office was challenged with replacing 2/5th's of the starting rotation while improving their below average team defense and bullpen. *Who says we need to preview all thirty teams? Replacing Ubaldo Jimenez and Scott Kazmir with lower-priced internal options and free agents limits the team's financial risk, but is a huge risk strategically. As an entire staff, Cleveland pitchers provided 15 Wins Above Replacement last season (per Fangraphs), ranking 16th out of 30 Major League teams. Jimenez (3.2 fWAR) and Kazmir (2.5 fWAR) accounted for 38% of the team's 15 fWAR. We applaud Cleveland's tact of investing in areas that do not involve Scott Kazmir and Ubaldo Jimenez. Looking at Cleveland's organizational depth chart, they may have enough resources to surpass 15 pitching WAR and contend with Detroit and Kansas City for the AL Central. In 2014, Cleveland's starting rotation will be lead by Justin Masterson. He had the highest WAR on the team last season and is entering a contract year, FWIW. Corey Kluber, Danny Salazar, and Zach McAllister should fill out the middle of the rotation. Salazar was outstanding in 10 starts last year, striking out over 30% of the batters he faced over 52 innings. The team has high hopes for Danny Salazar, expecting that a full season of him should replace what they got from at least Kazmir. If either Salazar, Kubler, or both complement Masterson as top of the rotation arms, Cleveland should have a good season. Zach McAllister needs to improve to be a consistently effective starter, but there's still reason for optimism. The fifth spot in the rotation has a bevy of competitors between Carlos Carrasco, Josh Tomlin, Shaun Marcum, Aaron Harang, post-hype bounceback candidate Trevor Bauer, Travis Banwart, and prospect T.J. House. Their rotation was a strength last season, but the bullpen often let the team down. Given that they could convert some of the 5th starter contenders into effective relievers, that should help, as should getting more than 20 innings from southpaw Marc Rzepczynski. The other left-hander in their bullpen will be new addition Josh Outman, from the Drew Stubbs to Colorado trade. Cody Allen has surpassed Vinnie Pestano as the primary setup man, but Pestano is a prime candidate for a bounceback season. How's this for a small sample size? Pestano has had 3 one-inning appearances this spring and performed perfectly, with three 1-2-3 innings. 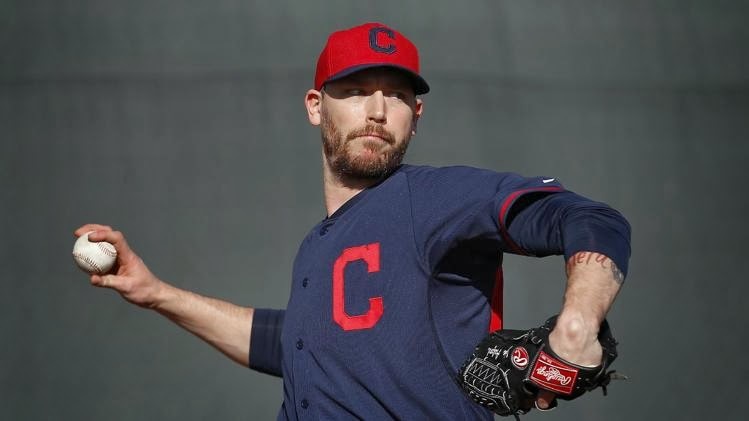 If Pestano and Allen lock down the 7th and 8th, the Indians will have the benefit of shortening the game to closer, John Axford. Another bounceback candidate, Axford could be one of the best pickups of the offseason. Lord knows Axford was a disaster during his struggles with Milwaukee, but his peripheral stats look really good for a bounce back to effectiveness. Axford still throws hard, in the 95-96 mph range. After struggling first the first six weeks of the season, Axford actually had a pretty terrific year. From May 15th through the end of the year, Axford had a 2.50 ERA and 2.4 K/BB ratio. He was very good after a late-season trade to St. Louis, and spending a couple of months getting coached by Dave Duncan can't be bad. Last year's Indians were not a very good defensive team. Yan Gomes is a good defensive catcher, and the two Michael B's - Bourne and Brantley - do a pretty good job of covering 2/3rd's of the outfield. Unfortunately, for Cleveland fans, that's about it. 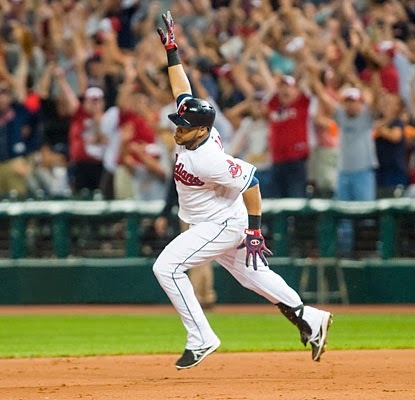 Baseball Info Solutions placed the 2013 Indians as the 7th worst defense in Major League Baseball, tied with Houston, with -41 defensive runs saved. Fangraphs defensive ratingsranks them as the 4th worst defense, better than only the Astros, Phillies, and Mariners. The addition of David Murphy to platoon in right-field with Ryan Rayburn, allows Nick Swisher to play first base, where he is better. The place for Cleveland to make up the most ground defensively is by having Asdrubal Cabrera and Jason Kipnis improve their defensive contributions. We're not as optimistic about Cleveland's defense, unless they succeed with platoon advantages, defensive substitutions, or reinforcements from the minor leagues. Their top prospect is a 20-year old shortstop named Francisco Lindor. Baseball Prospectus scouts him as "Incredible instincts for the game; near elite potential with the glove; silky actions; excellent backhand pickup; range plays up; arm is plus; total package at shortstop". Lindor can definitely hit. He has a career .364 OBP over 1,051 Minor League plate appearances. Scoring 4.6 runs per game, Cleveland tied Baltimore for the 5th highest scoring offense in baseball last year. Their supposed moves this season, to convert Carlos Santana into a third-baseman only enhances the team's ability to get their nine best hitters in the lineup. This is a smart front office and manager who can platoon players based on their hitting splits, as well as defensive platoons - better outfield for their flyball pitchers / emphasis on infield defense for groundball pitchers. Cleveland might not be able to maintain a Top 5 offense in this coming year, but if their pitching can be Top 10, and their offense is Top 10, they could be dangerous. They need to shore up the defense to contend. Cleveland fans could use the excitement. Comments? Questions? Let's hear 'em.